Tinted car windows are a wonderful thing. Not only do they protect you from glare, they also provide privacy and style. Unfortunately, the tint has a lifespan and if you don’t know how to remove window tint properly, you’ll end up with a big, sticky mess. There are two basic ways to remove tint: heat and scraping. 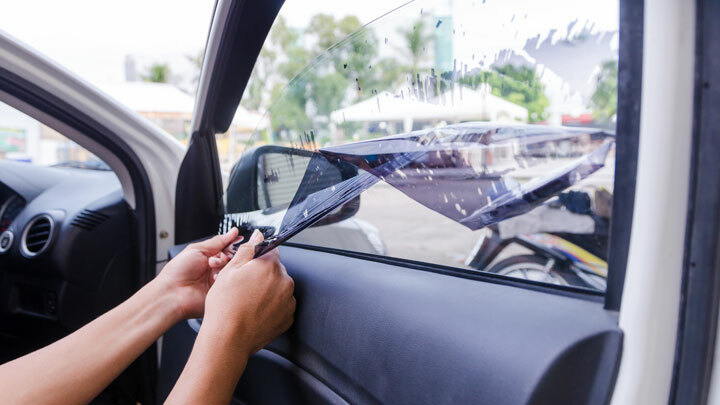 Depending on the reason you choose to remove the tint film from your car windows, the best treatment will be different. You will also need to clean the glass afterwards, as these methods don’t always completely remove the adhesive. There are three major reasons to try and get rid of the tint on your car windows, each posing their own sets of challenges. Sometimes you just don’t want tinted windows, even though they’re in pristine condition. This can be most frustrating, since the adhesive is likely at its strongest. However, heat methods work well against undamaged tint film. Bubbling film not only looks horrible, there’s no way to fix it. The first instinct you might have is to peel where it’s bubbling, but this can leave an even less attractive mess of glue and tint chunks. On the bright side, the bubbles are caused by failing adhesive, making it a little easier to remove. Over time, window tint will turn a purplish shade and you’ll want to consider replacing it. As the tint’s ability to block UV rays diminishes the more it changes to purple, the issue is more than simply an aesthetic one. This change in color is due to the breakdown of non-metallic dyes and cannot be repaired. Again, heat is an excellent way to deal with this problem. Heat is an excellent way to loosen intact film, although it may require some scraping to fully remove the film. Generally, you will need minimal use of a scraper for these methods. This is an easy way to remove tint and works equally well with a heat gun, although it can get a little messy. You’ll want to pick a corner to start the process. Hold the hairdryer about two inches from the window and run it on high until the glue melts enough to pry the edge up with your fingernail. Angle the dryer so it hits where the film and window meet, slowly peeling as the glue softens. Using a clean towel, rub the adhesive away, using your hairdryer to soften it as needed. 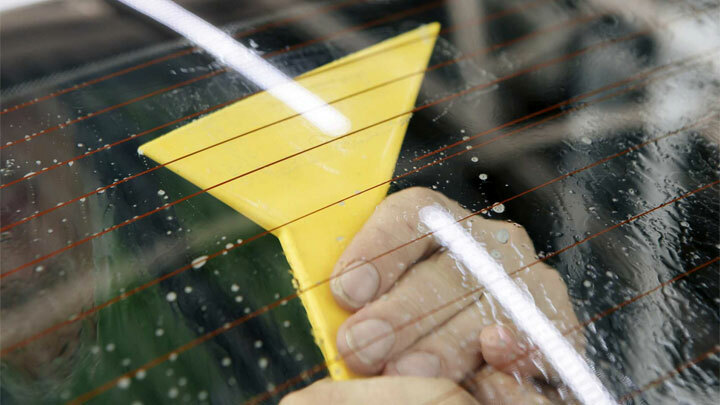 Once the glue’s removed, wash the car windows with cleaner. Perhaps the best way to remove window tint is to grab a fabric steamer. After several minutes of steaming the window, you’ll melt the glue and the tint will come right off. One great thing about this method is the excuse to also clean your car’s upholstery. Once the tint is off, you just have a bit of glue to contend with. You can take advantage of a warm, sunny day to make your job easier. You’ll need two black plastic garbage bags cut to the shape of your window, a spray bottle of soapy water, tarp, and a spray bottle of ammonia. Spray the outside of the window with soapy water and cover with one of the bags, smoothing it out until it’s flat. Cover all interior surfaces near with tarp to protect them. Spray ammonia on the inside of the window, making sure to wear a protective mask so you won’t inhale the fumes. Cover with the second trash bag before the ammonia can dry. Dig up a corner of the film and gently peel the tint away, spritzing with ammonia as needed to keep it moist. 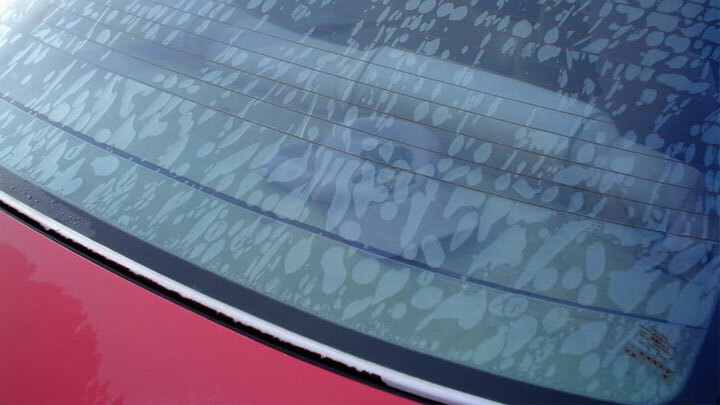 Use a non-metallic scraper to remove any leftover tint, then use one of the cleanup methods below to get rid of the residue. These options all involve taking off car window tint using primarily sharp objects. While they all work well, you should take extra care to avoid scratching the glass when using any type of blade. Non-metallic scrapers work best on plastic windows. A Note on Using Sharp Blades: We strongly urge you to use caution when removing tint film from any window with a metallic scraper. While using a knife or razor blade might work a bit better than a plastic blade such as an ice scraper, there’s a much higher risk of damaging the glass. In the event you need to use a sharp blade, remember to always hold it at an angle to avoid damaging the glass. 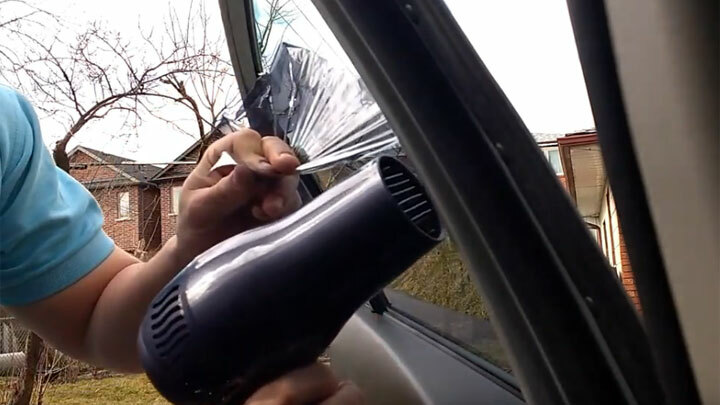 Old newspapers have a lot of uses, including window tint removal. Thoroughly wet the tint film with hot, soapy water and cover in newspaper. Let the window soak in the sun for at least an hour, adding more soapy water every 20 minutes. You should now be able to carefully scrape away the tint using long strokes. In the event you can’t remove the film easily, simply soak for another half hour. The slowest method is also the best choice for small areas or problem windows. Carefully cut an edge using a razor blade and peel the film away. Don’t worry about messy edges. Once the film is off, spray the area with soapy water and scrape away the glue. Finish off with a good round of glass cleaner. 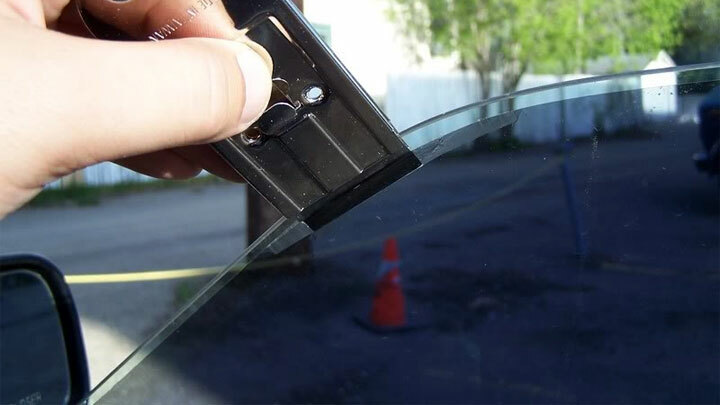 Finally, you’ll need to know how to remove window tint glue once the tint itself is gone. This doesn’t always happen as efficiently as one would hope. These methods all work well against any remaining gunk. One of the cheapest and most effective solvents out there, a bottle of 90 percent isopropyl alcohol can make quick work of leftover glue. Put some on a rag to get rid of smaller spots and a spray bottle and rag for larger surfaces. Be sure to use this method in a well-ventilated area and avoid breathing in the fumes as you work. This popular glue remover works great against leftover tint glue. Note that it won’t help with removing the tint itself. A surprisingly useful solvent, you can use nail polish remover a microfiber cloth, and some elbow grease to remove the glue. While this method requires some additional effort, the process will buff your windows to a beautiful sheen. On a warm day or in a heated garage, you can use hot, soapy water (we suggest using Dawn) and a car ice scraper to get rid of the glue residue. Not only is this a safe method, it’s also a good excuse to clean the car’s interior.